Last night we believe we witnessed the berth if not the solidifying of Nyansapo Productions legacy as a comedic powerhouse in stage play productions. 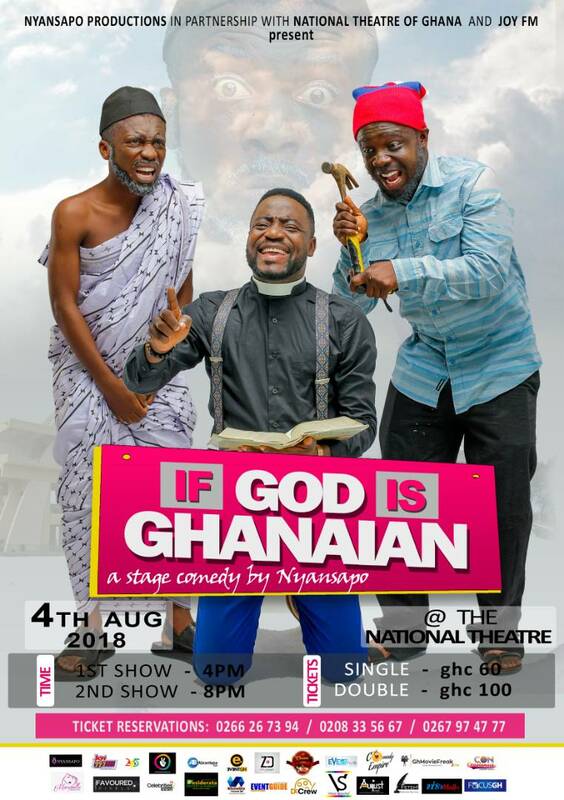 They pulled off a great show titled “IF GOD IS GHANAIAN”. A show with the kind of performances and humor that had patrons falling out of their seats with laughter even if you tried to contain it. The play is set in a compound house with tenants of varying professional back grounds. Things take an interesting turn when the landlord moves into the compound with his “supposed” daughter. They must avoid getting evicted by staying clear of her even as they all try to hide they own secret agendas. There’s no denying that Janeral Ntatia, Clemento Suarez, Foster Romanus, Doctor So, Daniel Delong and Komla Mensa have all proved to be awesome comedic actors with every chance they have gotten. And last night turned out to be no different. They were fully immersed in the individual characters they were tasked to play but they never lost their hilarious selves in any way. Perhaps they feel the need to constantly remind us how good they are and we doubt we would ever get tired of it. 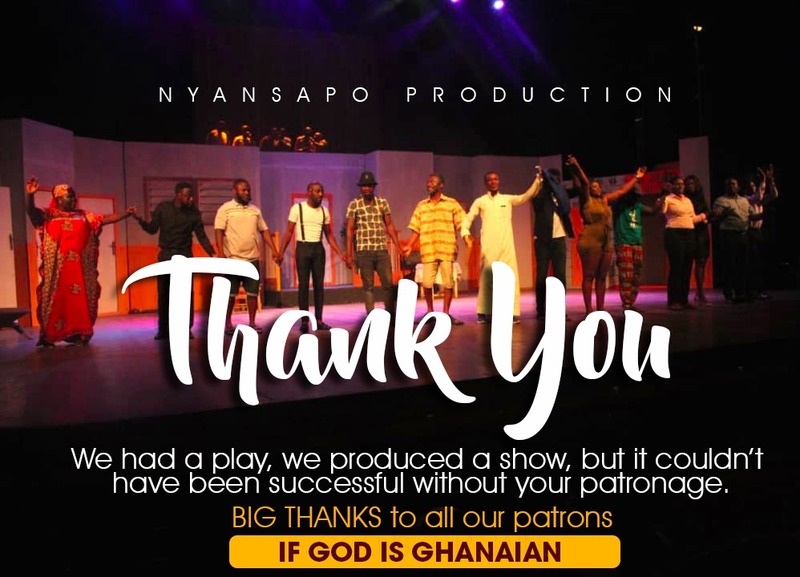 “If God is Ghanaian” as advertised by the producers is indeed a dramatic expose on the lives of Ghanaians. The play explores the typical landlord tenant relationship, people with different professions, how they the coexist and how they all contribute to the moral fiber of society. All this was done with unapologetic, hilarious and mature comedy interspersed with harmonious tunes. As well as the subtle play on trending political and social issues. Unlike their last production which was troubled by very unpardonable sound glitches, this production was flawless in the sound and lighting departments as well. The characters in the play were clearly audible in every act and the acapella performances accompanying some of the scenes was so pleasant to the ears. Although it took a while before the plays title settled with us it was worth the wait as we enjoyed the buildup of the “expose”. If there was ever a doubt in the comedic prowess of these talents, last night we were baptized and won over. We won’t hesitate to score them 4.5 out of 5 stars for the job well done. 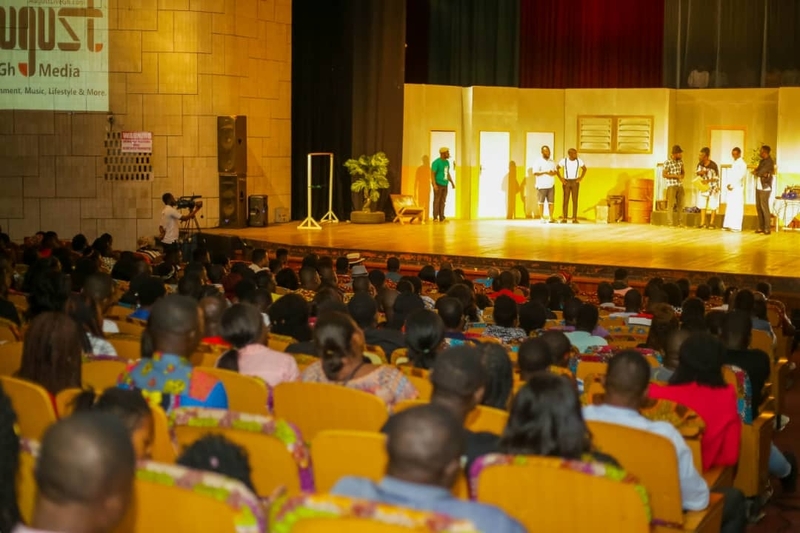 We are firm believers now, that this team of talents have come to stay as strong contributors to the sustenance of theater culture and stage productions in Ghana. This is by far the best play we have seen from them and we are definitely excited and can’t wait for their next outing. 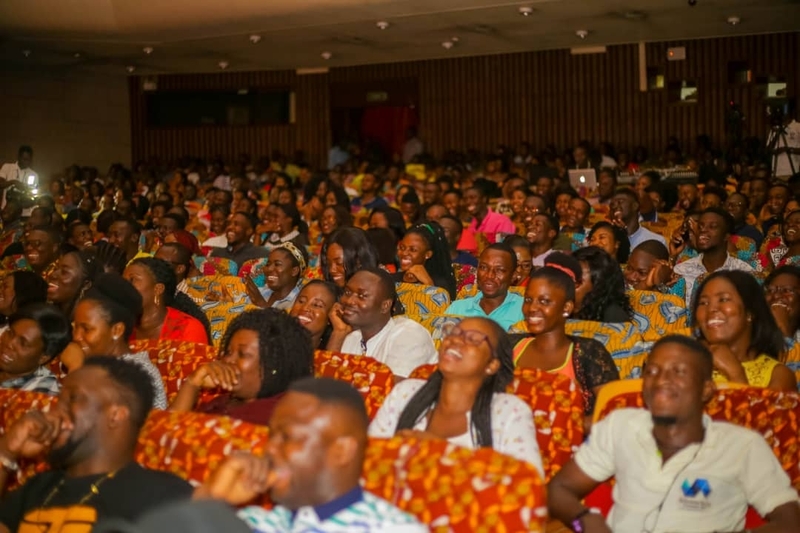 If you missed out on “If God Is Ghanaian” last night, then you missed out on a very good show. The kind of show that lives you satisfied with value for money. Be on the lookout for when next Nyansapo Productions would put this play together and make sure you don’t miss it. 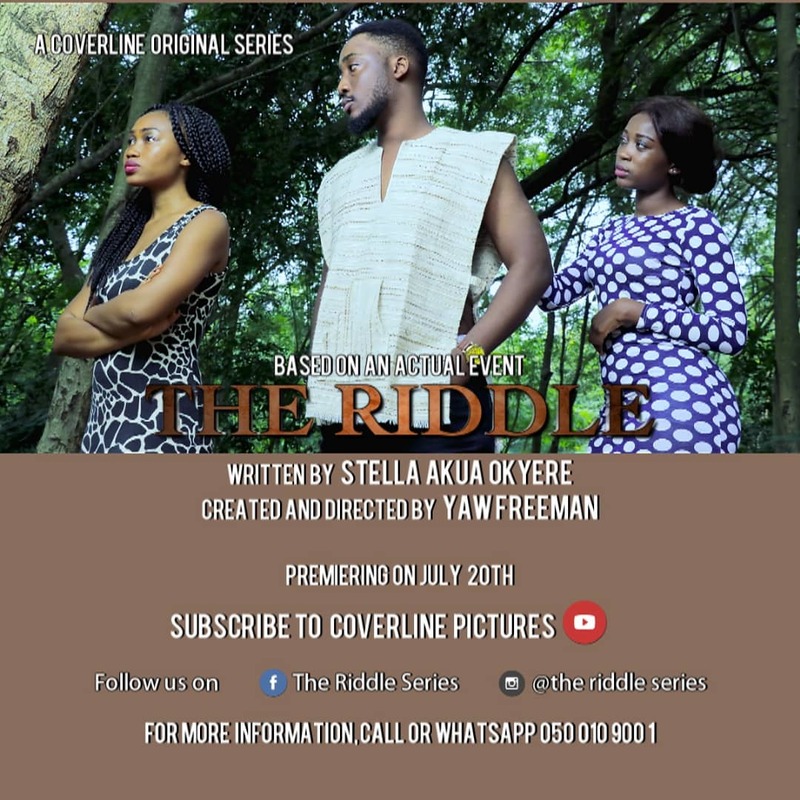 If you were at the National Theater last night do well to share with us in the comments section below your experience as well as your thoughts on this play. If there was we ever a doubt in the comedic prowess of these talents, last night we were baptized and won over. We won’t hesitate to score them 4.5 out of 5 stars for the job well done. We are firm believers now, that this team of talents have come to stay as strong contributors to the sustenance of theater culture and stage productions in Ghana. Stage Play: Dinner For Promotion, Another April Communications, Win. Stage Play: What Happened To Courtship? – A lot!